Isn’t it rather simple really…? If you add too much or remove to much from a circular system, it will eventually spin out of control or break down. Of course it is much more complex than this, and yes humanity has evolved and benefitted immensely in the mean time. But the fact remains; for the first time in the history of Earth, one single species have become so influential that it holds the power to destroy conditions for a prosperous life as we know it – to break the cycle! After decades of “linear flows” of energy, resources, money etc. with far-reaching and devastating effects. Finally the virtues of circular systems, so ubiquitous in nature around us, are slowly starting to gain foothold also in man-made processes. But it is not an easy transition. Most current business concepts depend heavily on the linearity of “Take-Make-Dispose”. Which in turn is dependent on an infinite abundance of natural resources and a planet that can handle all the waste and emissions produced. But there is change underway. Just take a look at the homepage of Ellen MacArthur Foundation, Cradle to Cradle, or Stockholm Resilience Centre. All of them promoting a Circular flow of money, energy and resources as a “basic condition” to keep within the planetary boundaries. And there are plenty of success-stories around. Take a look at companies like Interface and Desso or why not take a look at how IKEA is promising that >50% of the non-renewable material used for its products will be coming from recycled sources by 2017. Going from Linear to Circular is a rather complex transition and it is very likely that many linear-based corporations will become “obsolete” when new set-ups, designed with circular flows as a prerequisite becomes the new standard. But there will of course also be companies that, although their business is linear when looked at individually, becomes circular when it is included as “one part” within a larger cycle. 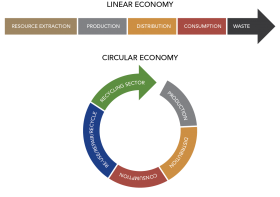 In certain industries it might also show that a circular flow cannot provide the mass-production levels of today, which in turn requires more structural changes to consumption-patterns etc. A circular system is also more interdependent of a balanced flow throughout the cycle (-s). To much flow at one stage in the cycle will create “excess/waste” making it “linear” again. To little flow will create a “deficit” and a need for more virgin resources being brought into the cycle. Over time this will probably level-out, but it will definitely influence the transition-process a lot. This all calls for a much wider and transparent cooperation within corporations and between different stakeholders. It will also create a need to thoroughly screen all aspects of a process, product or service to find ways of closing the loops. i.e: For a production process where a lot of excess-heat is generated it will be equally important to bring this heat into a “secondary” cycle, as it is to produce the product itself. If it isn’t feasible the whole process needs re-evaluation and change… If any excess or deficits are not connected to / included in other cyclic processes, no real cyclic process is actually achieved. The transition from linear to circular is by itself most likely not enough to make our society Sustainable. It will definitely also need a general reduction of our total consumption. With, soon 2-3 billion more people on the planet and at the same time 2-3 billion more people entering the affluent “middle-class” there are simply not “pristine” resources enough, and the planet cannot cope with all the waste and emissions we create. In a business landscape based on linear economy and fragmented in a lot of businesses, linked together in complex networks it is not easy to convert to a circular business-model. Especially if you aren’t a big player in full control of every aspect of your supply chain. 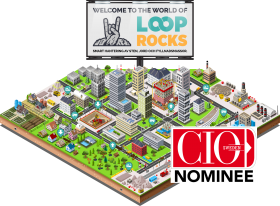 The app has gained widespread interest and has even been nominated as a finalist in this years Swedish CIO-Awards, in the category; Sustainable Projects. Number of users: currently more than 600. 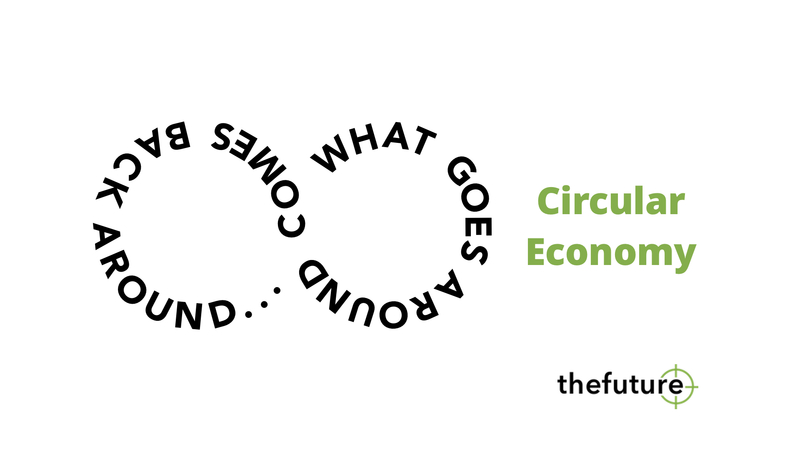 This Start-up is not “circular economy” by itself. But it helps to facilitate a flow where someone’s waste becomes another one’s resource – closing the cycle. Some organizations actually claim that incinerating waste relieves society of a “problem” and therefore primary-energy coming through the linear resource flow should be valued at “0” when compared to other primary energy-sources used to fuel their incinerators… Because “these products were made for another purpose (not energy) to start with”. This approach works contradictory to a circular flow. Whitewashing incineration as some kind of “miracle-solution” – pretending that a linear flow is something it definitely isn’t. 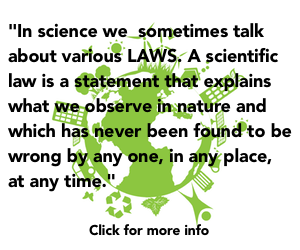 In a circular flow – waste is not existing! Transition to a Circular Technosphere in balance with the Biosphere is the way forward, and it is Urgent!